Our second accident. Again, not really our fault, but it's likely we were invisible to the big rig that cut us off, forcing us onto the median strip. The car wasn't damaged too badly. 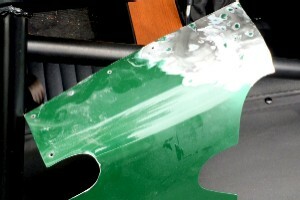 Some duct tape bodywork repairs and we drove it the rest of the way home. The floor on the driver's side high-centered on the concrete and got pushed up a little. It oil-cans now when we step in the car, but it did that when we first welded in the floor, and it went away back then, so we expect it to go away again. We're glad at least we used heavy 16-gauge steel for the floor. Our Locost has always felt like a tank. Now we know that's not just a feeling. It is a tank. When we swerved to avoid the truck, the front wheel hit the curb and jumped it cleanly. The suspension didn't hit anything, although the nose and front body panel were not so lucky. The front wheel then crashed down on the other side, the car sliding on its belly over the concrete, scraping up the floor, until the rear wheel hit the curb and lifted the car up and over it. Very tank-like. We've actually driven over worse bumps. This one didn't even bounce us out of our seats. The frame took all of this roughhousing without complaint, although one corner of the nose got totally crushed. Interestingly, what saved the rest of it was something we poked a lot of fun at when we first built it—the steering rack mount. We knew at the time it was total overkill, but we tried to justify it by explaining how it reinforced the lower front suspension pickup bracket. Not that we'd ever need the extra reinforcement, unless we somehow managed to catch the lower nose tubes on a curb or something, and what are the odds of that happening? 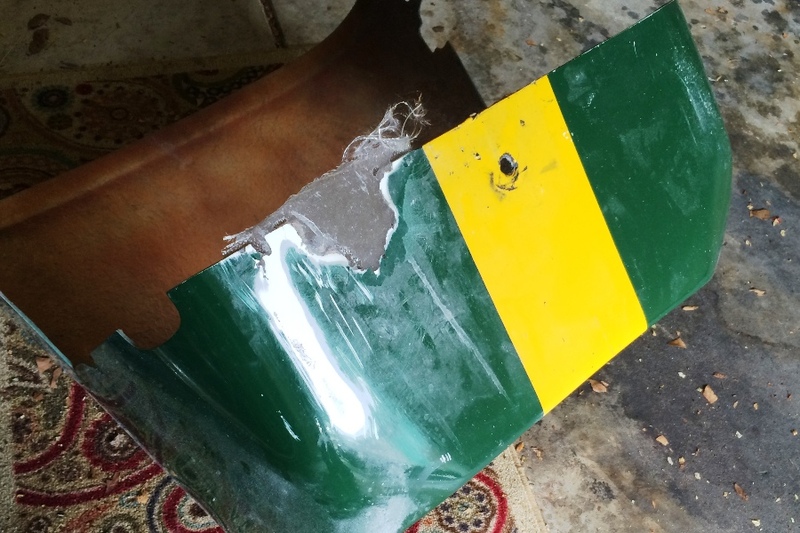 We patched the nose with fiberglass materials left over from our last accident, and pounded out the forward body panel as best we could with a hammer. The accident had neatly sheared off all ten rivets that held the panel in place, ergo the need for duct tape to get home, but beating the panel was considerably easier with the piece off the car. We originally made these pieces out of thick .050 aluminum, not because we expected them to take a beating, but because that's all we had in our spare metal bin. Good for us. Anything thinner would've been totally destroyed. After coaxing the panel back into shape, or close enough, we patched up the wrinkles we couldn't pound or grind out with epoxy filler. 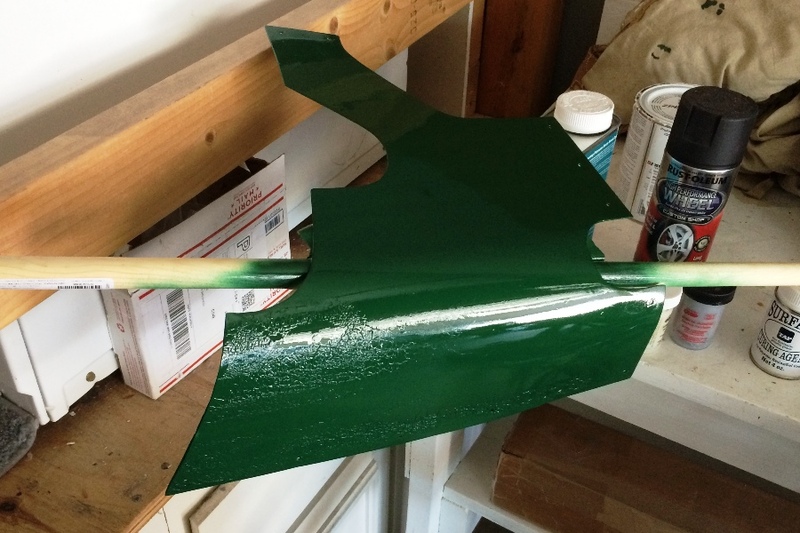 We then sanded the panel smooth and shot it with Rustoleum Hunter Green from a rattle can, which we knew would be a total mistake and it was, because the stuff never dries. A second coat the following day wrinkled the paint badly, eerily reminiscent of our early struggles with painting the scuttle. Or maybe not so eerily. We'll try painting it again next week. Meanwhile, with the nose cone on the car you hardly notice the panel is missing. 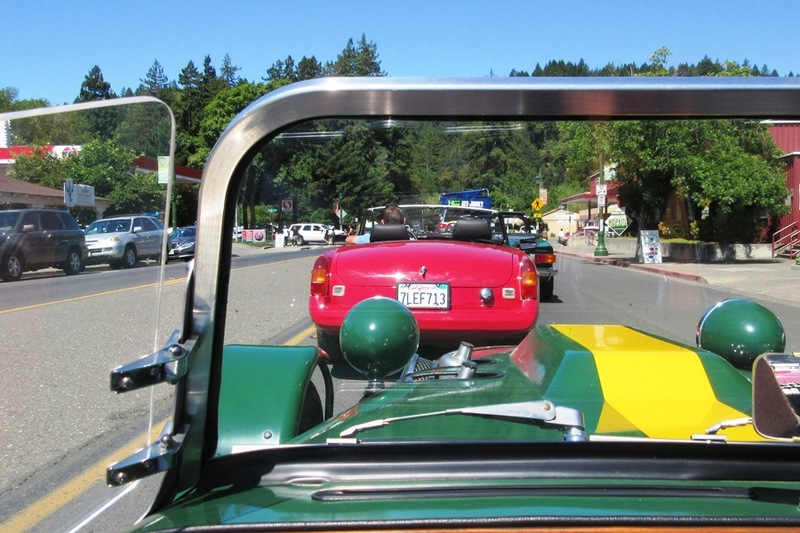 Although the frame is structurally sound enough to drive the car, we're scheduling repairs anyway, on or about the Fourth of July weekend, for a couple of reasons. First, the corner of the frame looks bad, all crushed like that. 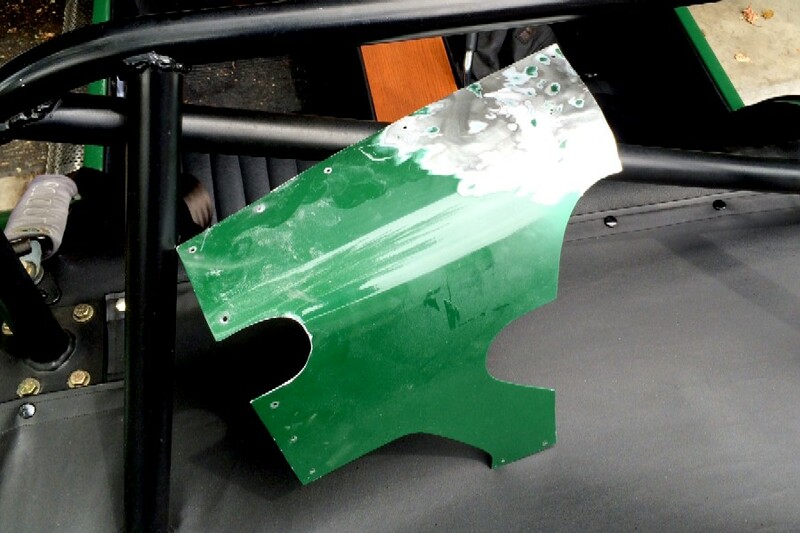 Second, we need to rivet the forward body panel to that corner, and we can't if it's crushed. And third, the frame is not as structurally sound as it was before it was crushed. Yes, we're overkill freaks, but you try driving a car you built yourself down the freeway at 70 miles an hour in heavy traffic and see how relaxed you feel. 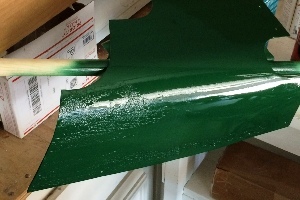 Drawing upon our many years of experience fixing crashed model airplanes, we'll effect the repairs by first cutting away the damaged area, then welding in new tubes, reinforcing the joints with short sleeves inside the tubes. This will require us to take a lot of the car apart, or at least the front end, but we think we still remember how to do that. Afterwards we'll repaint the area good as new, rivet on the forward body panel, and take pictures just like we used to back when we were building the car. As usual, we'll also let you know how it goes. The weather here has turned hot. Summertime hot. It's not supposed to last too long, a week or so, but it's given us a chance to fully test our rerouted cooling system and recently-calibrated temperature gauge. 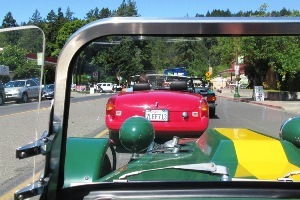 The 33 ohms of resistance we added to the temperature sensor has kept the gauge needle close to center most of the time, but an afternoon drive through the tiny tourist town of Guerneville, CA in Memorial Day traffic pushed the needle halfway to H before we got moving again. What temperature that represents is anyone's guess. Ours is 240. Maybe 245. 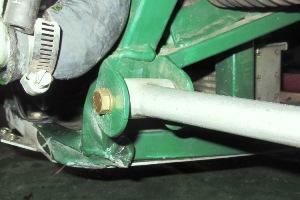 According to the Internet, that's about 10 psi of pressure, well within the cooling system's capacity. So we wouldn't expect to lose any coolant, and we could've easily verified this by checking the coolant level when we got home, but unfortunately we gave up doing that a while ago, because the level never changed. When we finally did check it after a few days, we had to add about two cups of Prestone to bring us back up to the 1" level, so obviously a little water snuck out somewhere. But it didn't go into the overflow bottle because that was empty. Radiator cap totally unneeded. Also unreadable. 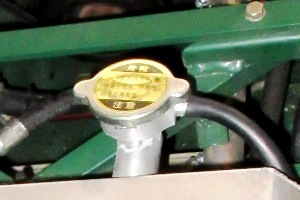 It could've been our Chinese radiator cap. We're not sure what the specs are for the cap because they're in in Chinese. 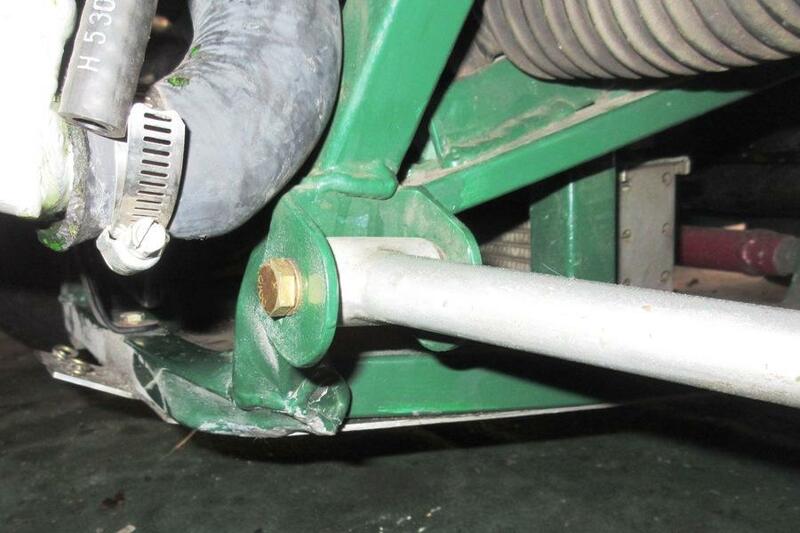 The filler overflows to ground, so there's no trace of coolant loss, nor would there be. But we might try a new cap. 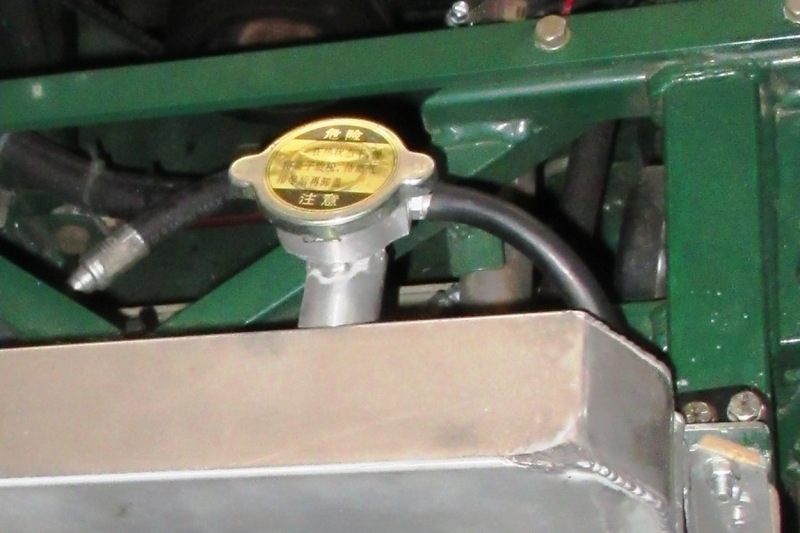 Ideally we'd like to cut off the filler neck entirely and weld in a patch, but it's aluminum, so we'd have to pay someone to do it. Maybe at the same time we could get the corners of the top tank cut off and re-welded so our nose cone doesn't crack any more. Or we could just let it go. It's not as if the nose cone hasn't taken a few beatings already. The good news is, even a pint low the new cooling system has way more coolant than the old one did when it was full. The cylinder head is still always underwater, which is the reason we modified the cooling system in the first place. Like last year, we're going to mostly ignore the temperature gauge this summer, and try to stop in the shade whenever we can, not for the car but for us. There's only so much heat you can take. Our long-suffering engine is on its last legs anyway, and I know we've been saying that for a while now, but this time we really mean it.